Sonny McLawhorn Joins Ward and Smith, P.A. - Ward and Smith, P.A. Sonny McLawhorn Joins Ward and Smith, P.A. Ward and Smith, P.A. is pleased to announce that prominent Greenville attorney Charles L. McLawhorn, Jr. has joined the firm. 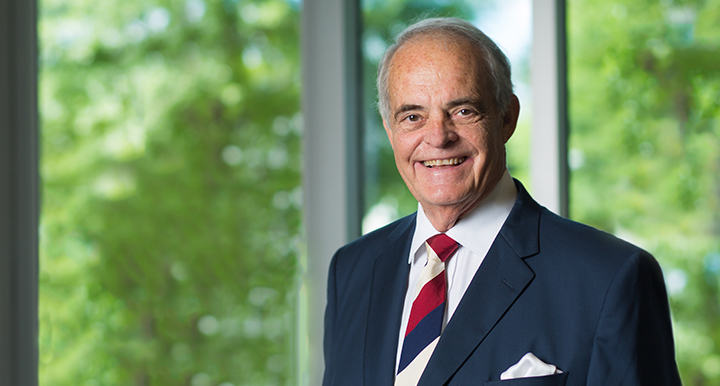 Since founding his Greenville practice 39 years ago, Sonny McLawhorn has represented generations of Greenville area clients on matters including trusts and estates, agribusiness, litigation, and a range of other complex legal issues. He will be working closely with the Ward and Smith team to provide his clients with the benefit of Ward and Smith's full‑service capabilities. "We're honored that Sonny McLawhorn has chosen to continue his distinguished legal career as a member of the Ward and Smith team. His stellar reputation and dedication to superior client service will be an asset to Ward and Smith," said co-managing director Brad Evans. "Ward and Smith represents the gold standard for excellence," said McLawhorn. "The firm enjoys the respect of judges and practicing attorneys throughout North Carolina. It is a great honor and privilege to be invited to be a part of the firm." McLawhorn began practicing law in Greenville in 1977. He ranked first in his class of 200 at the Oklahoma City University School of Law and was elected Editor-in-Chief of the Law Review before earning his Juris Doctor degree with highest honors in 1976. He subsequently was awarded a Kenneson Fellowship to study at New York University where he obtained a Master of Laws degree in May 1977. McLawhorn earned his Bachelor’s degree from East Carolina University (ECU), where he majored in Political Science and minored in Broadcasting. McLawhorn grew up on a tobacco and dairy farm in the Pitt County community of Renston. He is a frequent guest lecturer at ECU and is active in community and professional organizations including Albemarle Bank and Trust Company (local advisory board), the North Carolina Bar Association, and the North Carolina Foundation for Christian Ministries. He and his wife, Lisa, are involved in the church, and his three adult children also are attorneys.